Page Smith, the first provost of Cowell College, called Alan Chadwick "a fiery, Old Testament prophet", and that was, perhaps, an understatement. The characteristics that he looked for in his apprentices were strength, humility, competence, positivity, dedication, and an inward philosophical nature. It was mostly a process of self-selection though: If Alan didn't like the cut of your jib, then he would call you on your pretensions—sometimes at high volume. You either left the garden permanently, or you made some necessary adjustments to your attitude and kept working. 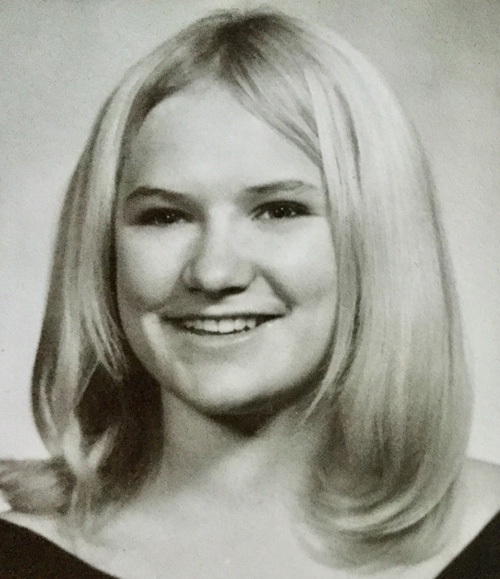 Louise Pease was one of those rare individuals who were already nearly fully self-realized at the tender age of seventeen, and who didn't need to be painfully hammered into shape on the Chadwickian anvil. "Alan was always kind to me..." she says, and this was undoubtedly due to the fact that she was already an utterly authentic person without pretensions. Louise always had a kind word for whomever she met, either old friend or newly arrived apprentice. Her cheerfulness was contagious, and this could work wonders to lift the spirits of a poor soul who was trying to get his bearings in the social dynamic of the garden for the first time. She is the kind of person who looks for ways to lift you up, rather than to tear you down, like so many others unfortunately try to do. 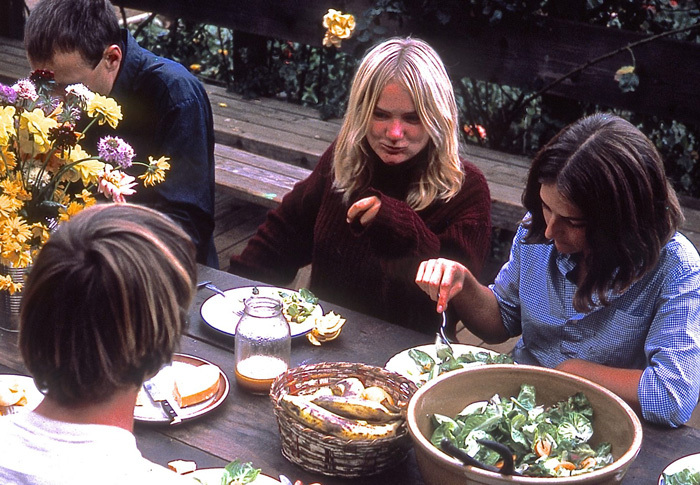 "I arrived at UCSC to begin my Freshman year at Cowell College in the Fall of 1969. I found the Garden, and its impressive Alan Chadwick, early that Fall. It soon became a major part of my life. During Spring quarter I took the Garden course, inspired by Alan’s words and his vision. 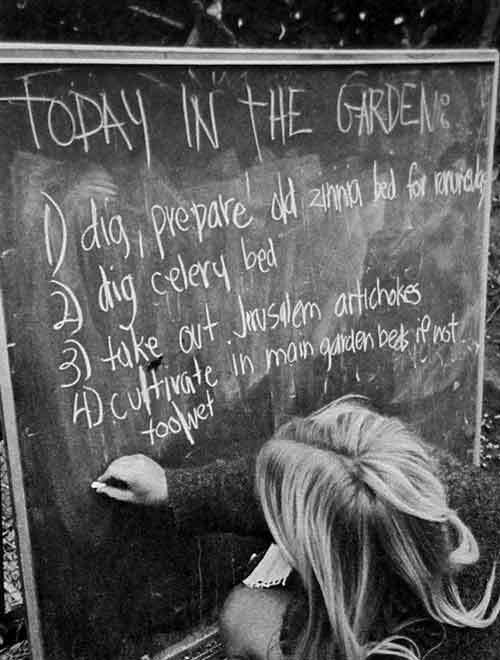 I spent the summer of 1970 working in the Garden. The following two years I continued to work there regularly, getting in on the beginning of the Farm down the hill. During these 2 1/2 years I saw incredible qualities in Alan. I am grateful for it all. I love that Garden. My parents and two of my sisters had died in a car accident in 1966. Working in the Garden with such an incredible group of people was very healing for me. Other connections with Alan....We talked about life frequently. I was thankful to learn the skills of gardening, and to benefit from his life vision. We also camped with him in the Sierra, and I visited at Green Gulch and Covelo. I did not put him on a pedestal and he appreciated that. Alan was always kind to me. I am grateful for the friendships begun at The Garden. I loved Alan Chadwick." Like other apprentices in the first years of the garden, I lived out in the woods behind Merrill College during the time I worked with Chadwick at UCSC. The dense redwood forest there provided many opportunities for secret sleeping spots that the University police could never find. This arrangement was usually fine, except during periods of inclement weather. I had friends who would creep into the glasshouse at night to get out of the rain and then wake up early to leave before Alan arrived in the morning. One drizzling afternoon I came down with a high fever. After soldiering through my late-afternoon chores, I desperately needed a dry place to rest. Nearly delirious with fever, I hitched a ride into town and went inside the Bookshop Santa Cruz. In those days, they had an enormous round water-bed set up so that customers could relax while they looked at the books that they were interested in purchasing. I lay down on that water-bed and must have slept for several hours because the next thing I knew it was 9:00 PM and the store was closing. They politely but firmly told me I had to leave and ushered me out to the sidewalk in front of the door. I was now much worse. I thought of huddling in the doorway for the remainder of the night... anything to stay out of the direct rain. I remembered that Mrs. Jean White, an elderly matron who used to frequent the garden, had sometimes helped apprentices in dire need (Alan used to call her affectionately "Mrs. Hezikiah Pumpkingarter), but I had no way of communicating with her. In my most acute moment of desperation, I heard a voice nearby saying, "Greg, is that you?" Looking up, I saw Louise Pease approaching with her arms outstretched, as if to keep me from falling over. As soon as she understood the situation, she told me firmly, "You're coming with me." I stumbled into her car, relieved that it was dry and warm. I can still remember that the heater made it cozy in there. The next thing I knew Louise was covering me up with blankets, and then complete oblivion. A day or two later, I woke up and looked around. I was in a bed under a down comforter in a warm house that was clean and beautiful. I just lay there wondering where I was, how I got there, and asking myself how long it might be before the rightful owners would come and discover me there and then throw me out. Before long, the door opened softly and Louise looked in. She asked me if I wanted some water, or if I was hungry. I gratefully accepted the water, but still could not eat anything. Immediately I must have fallen back to sleep because it was the next day when I woke up again. Now I was hungry, and so Louise brought me some breakfast. The fever had subsided by then and I was well enough to go. The rain had passed: It was sunny and warm outside. I was still alive. Who else would give up their room for three days to somebody who had no family, no resources, no money? She knew that I was working in the Garden, and I knew who she was, but we were hardly acquainted at that time. It was an act of mercy that could very well have saved my life... otherwise I would probably have died of pneumonia. I still fill up with gratitude whenever I think of that experience. Years later I met her at a national conference for Waldorf School teachers. 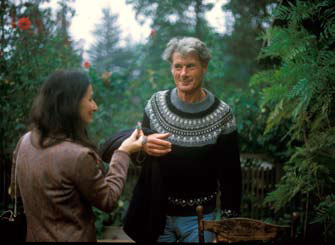 She had become a teacher in the system founded by Rudolf Steiner that Alan had introduced us to when he was invited to speak about biodynamic farming at the Highland Hall Waldorf School in Los Angeles. She is still involved in Waldorf Education as I write this in the spring of 2018. She has never stopped helping people all her life. Thank you once again, Louise. 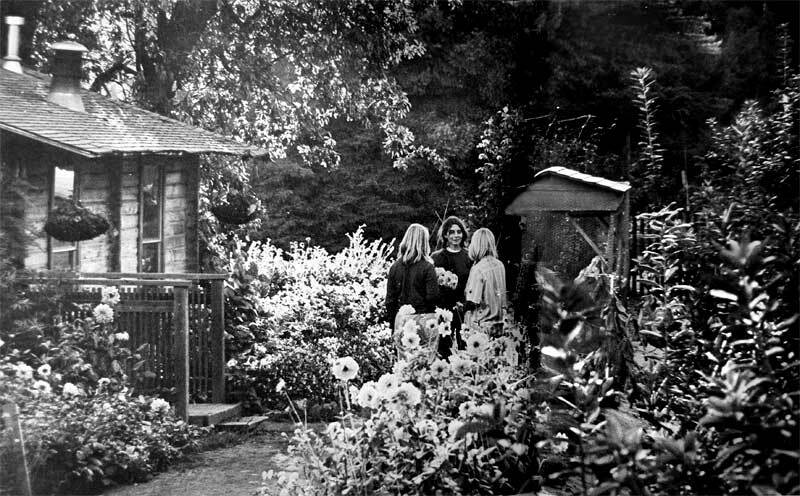 Louise Pease (right) with Kathy Dicky (left) and Ramah C. (center), in front of the garden chalet in 1970. 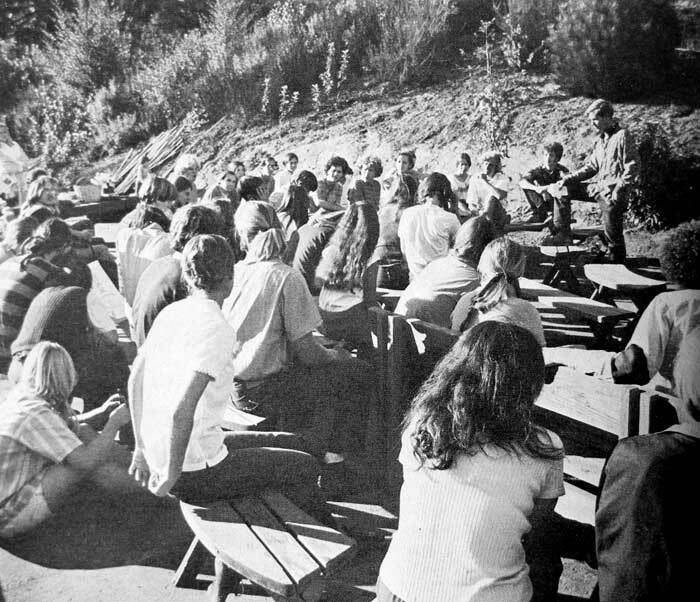 Dan McGuire, student president of the UCSC Student Garden Project, explaining the proposed farm expansion to a group of University students. Louise Pease seated at lower left.